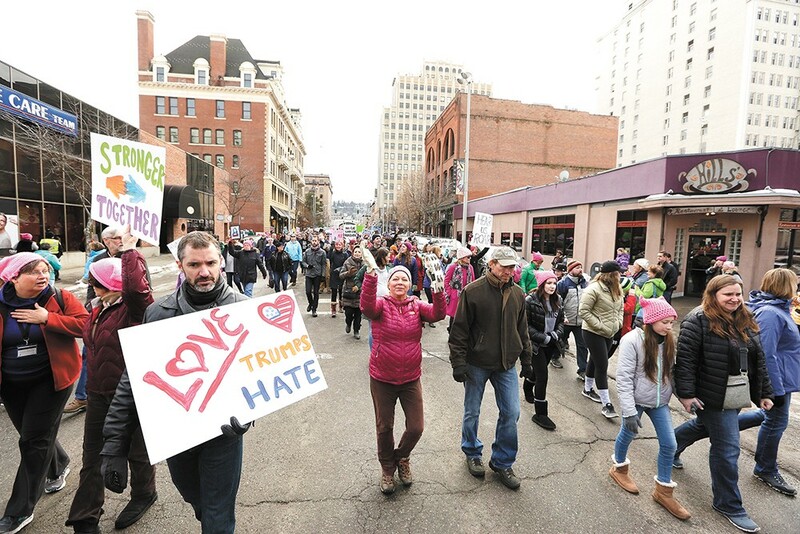 Thousands turned out for Spokane's march. Isaac Jack Jr.: What do you feel has been accomplished here in Spokane? Increased equality and respect are common ground. What helps? I know I keep [my] ear to the ground regarding law enforcement brutality and profiling. Allie Rawlins: I've seen a lot of people asking what the march was about. While standing in line to enter the convention center, my friends and I took our sign around and asked people to write what they were marching for on the back. I liked the idea of showcasing the multitude of issues that brought so many out that day. A lot of critics are trying to narrow it down to one or two things, but we marched for everyone that day. The love and inclusion could be felt by everyone there. Willie Streeter: Not being smart what rights are women losing? Angela Dickey: Donald Trump just signed an executive order to cut federal funding for abortions. We are losing safe abortions and I'm pretty sure he's coming after birth control, too. Virginia Rhodes Korn: By de-funding Planned Parenthood, women are losing the right to affordable health care, birth control, and mammograms. Women still don't earn equal pay for equal work. By cutting funding for battered women's shelters, abused women are forced to live with their abusers or try to escape with their kids and go into hiding. They need protection.